Factory spot was on the center carb as you described. Do the parts place carbs have the low backside vacuum ports? If your running the stock timing settings, you can just hook it to manifold vacuum and readjust your idle speed accordingly. The engine will idle better and run cooler with the extra timing. ok, its great to know, i bought my carbs in 2010 they have made some changes to them, i guess they took the numbers of the end carbs plus some other things that iam not sure of, on my center i just run my pvc valve, the end carbs had no vacuum source, i had to drill the bases out to get vacuum for my power brakes and transmission, thanks for your help john.. 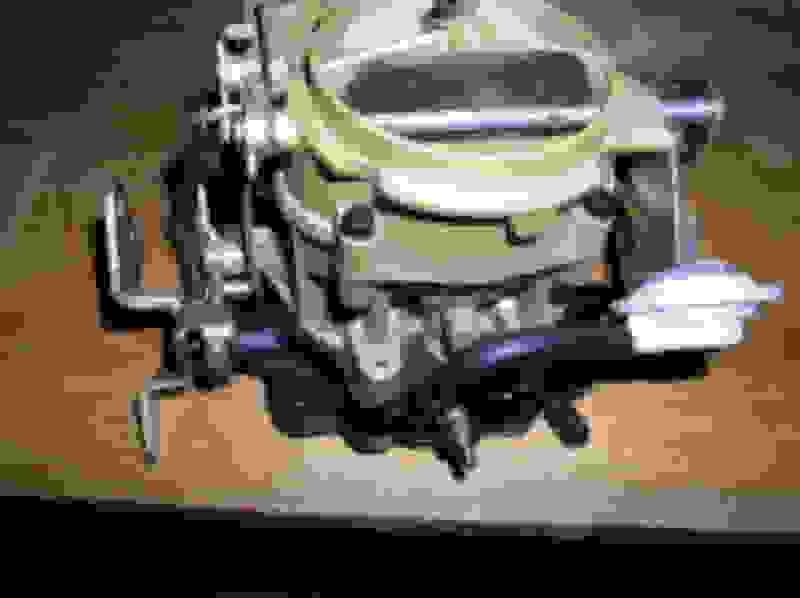 There are no intake manifold vacuum source other than the port he described on the center carb.. I have not seen a set of the Parts Place carbs but I have a theory about them. Nothing about them are true OEM tri carbs. 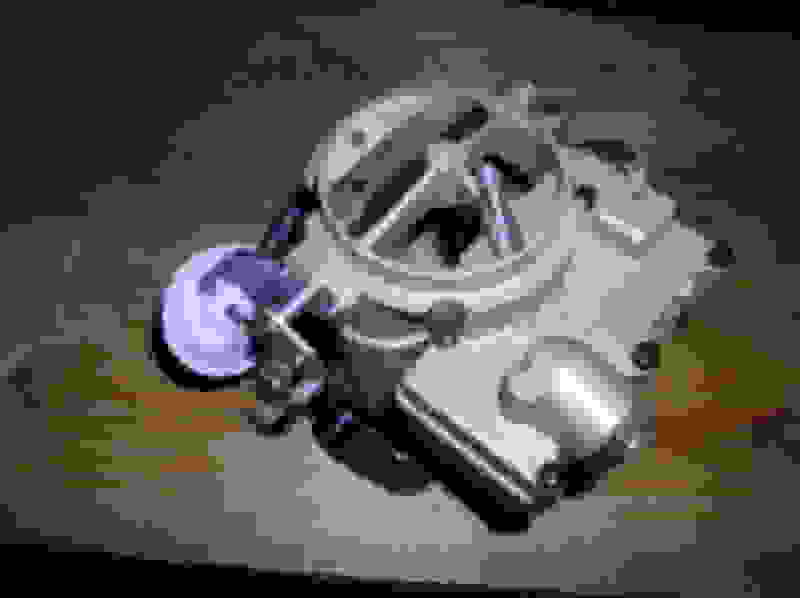 In a 66 tri carb,the center carb is smaller in the venturi or fuel bowl than the end carbs by 1/8". I think they are taking other years 2GC carbs and making end carbs and they are not correct as far as size. In other words all 3 carbs are the same size and shouldn't be. The air horn & bases are reproduced but the center section/fuel bowls are not. 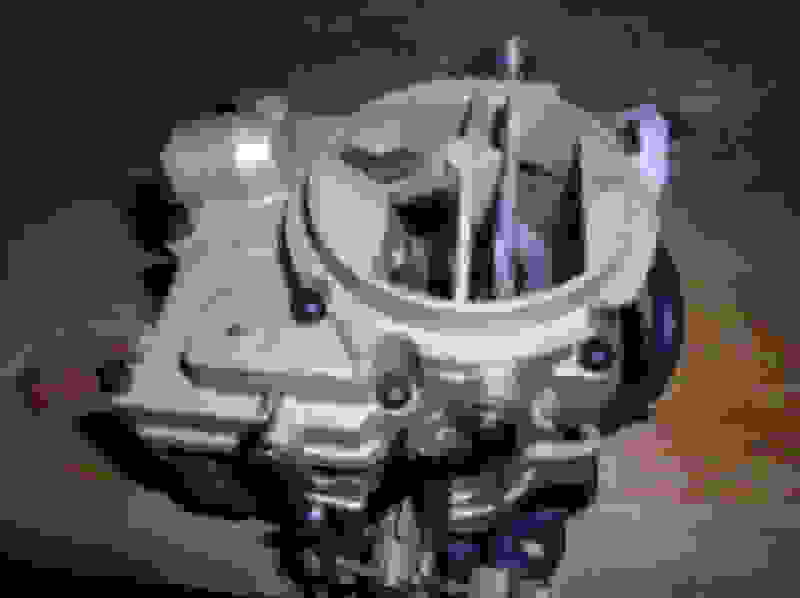 There were several different models that have a center section/fuel bowl that can be used to duplicate a center carb but as I said,the only correct end tri carb is larger and there not another carb with that size center section/fuel bowl to my knowledge. Another thing,the 66 Pontiac tri power doesn't use the vacuum port on the center cab like an Olds does. They get their vacuum advance from a hollow carb mounting stud.. My guess is they are using Pontiac bases to make the Olds carbs and there is no vacuum provision in the base.. The casting numbers in the center section/fuel bowl will tell if my theory is correct. The casting numbers are different than the carb part numbers. The Olds carb parts numbers are 7026055/7026056/7026057. I have 3 sets of OEM tri carbs that I can check the casting numbers. 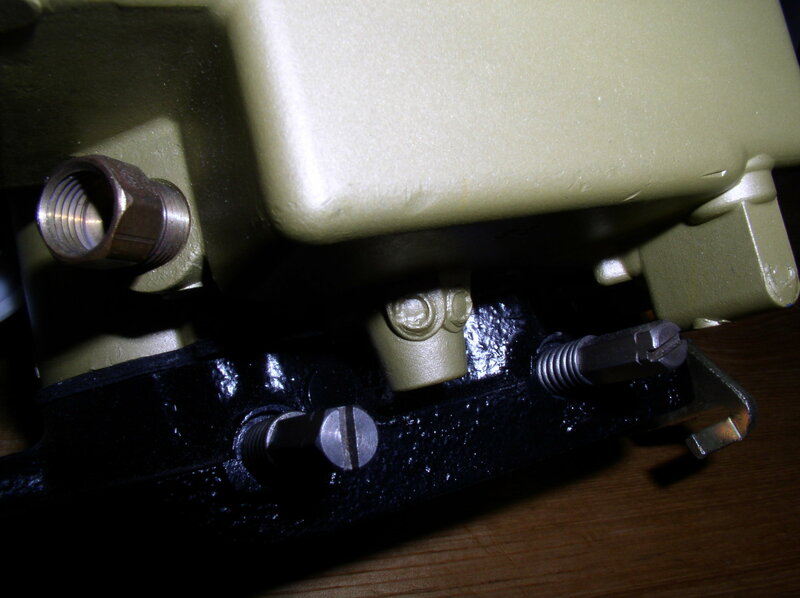 With a true Olds tri carb,all 3 bases are drilled for vacuum where as the Pontiac only have 2 bases drilled. You can't use the base vacuum for advance because it's unported vacuum and will maintain vacuum on the advance @ all times. You can drill the center carb in the boss to get a source for vacuum as the passage is there. If you do this,you will have to buy an Olds base to get the vacuum to the passage. It could be the base on your carb is already drilled,don't know because I haven't seen one of their bases. I sell a lot of repo Olds tri carb parts including made in the USA bases,not the Chinese units sold by the Parts Place. Does your center carb boss where the vacuum fitting should be look unmolested or does it look like it may be filled with something? Last edited by 66-3X2 442; January 6th, 2019 at 08:10 PM. and the carbs and the xtra carbs , stop over again and buy some carbs!!!! brian, i just figured it out its you !!!! Awesome !! nice olds !! love the toros also ! !~ 66 is my favorite !! OK,that's what I figured. Are the ones Mike bored out the TPP carbs? If so,that's what they are doing,using regular regular 2GC carbs and making tri carb end carbs. I checked their website and they are using the same part # for both Olds and Pontiacs. That's not possible for correctness. They are doing the same thing for the center carb,using other model carbs and making them. In their pictures the center carbs do not have the bowl vent like the OEM carbs. I know Mike Wasson,very nice guy who has helped me a lot. Properly done, Tri-Carbs run well. Even with my sorry driving, my 66 has run 11.51 and 118.97 mph. Cobbled up and mismatched, who knows. I got my sets (one sold with #24, one set with #13, one on Rund, one spare) in the early to mid 1970s. Glad to see you're admitting your driving is sorry but I still love you Dad. 66-3x2 442 i think you mean the parts place carbs, TPP ?? if so yes that's the one mike wasson and the tri power team did for me ! John is there any connection between you and Fluery & Mann ? the best we have done with our olds is 13.34 at 100.44 uncorked with 331 cogs, finally this year were going to put some 373 in there hopefully it will give it some more ump !! 66-3x2 442 i think you mean the parts place carbs, TPP ?? if so yes that's the one mike wasson and the tri power team did me ! T (the)P(parts)P(place) =TPP OK,that was my theory,using other carbs to make tricarbs. Gotcha ! and yes those were the ones they did ! OLDSter Ralph no iam all alone no brothers !! As you probably know,the bowl vent is missing from the air horn and it looks like the boss is missing on the right rear of the base. Also there's an extra vacuum pipe on the rear of the base. Why would need bowl vent?? OK,I guess anything that work is OK now.